This image shows a 777-300ER in Cathay Pacific livery. HONG KONG, March 9, 2011 /PRNewswire/ -- The Boeing Company (NYSE: BA) and Cathay Pacific Airways today announced the Hong Kong-based carrier ordered 10 Boeing 777-300ER (extended range) airplanes valued at $2.8 billion at list price. 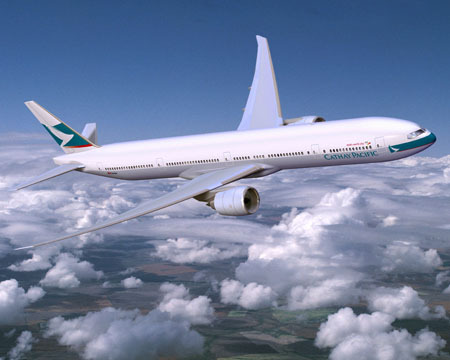 Cathay Pacific first announced its selection of the 777-300ER for its fleet requirements in 2005. With this order, Cathay Pacific will increase its Boeing 777-300ER planned fleet from 36 to 46 (including 4 leased). It's the fifth increase in its acquisition plans for the long-range jetliner. "Cathay Pacific is a world-class carrier and a valued long-time partner. It has made the 777-300ER the foundation of its significant fleet enhancement for long-haul routes," said Marlin Dailey, vice president of Sales & Marketing for Boeing Commercial Airplanes. "The 777-300ER will as always provide superior operating efficiency, economics and reliability, as well as a very comfortable cabin experience for the passenger." Cathay Pacific uses the Boeing 777-300ER as the backbone for its ultra-long-haul and long-haul fleet, mainly serving destinations in North America and Europe. "The Asia Pacific region is the world's fastest growing aviation market and Cathay Pacific is well positioned in Hong Kong to take advantage of this blooming market to grow our business," said Cathay Pacific Chief Executive Officer Tony Tyler. "Our newest 777 order highlights our continued commitment to developing Hong Kong's role as one of the world's leading international aviation hubs. As we continue to expand our fleet, the 777-300ER will play a crucial role in our operations in the years to come." The Boeing 777 family is the world's most successful twin-engine, long-haul airplane. The 777-300ER extends the 777 family's span of capabilities, bringing twin-engine efficiency and reliability to the long-range markets. In additions to Boeing 777-300ER, Cathay Pacific operates 12 Boeing 777-300s, five 777-200s, 45 747-400s in both passenger and cargo versions. The airline also has ordered 10 Boeing 747-8 Freighters. More than 60 customers around the world have ordered nearly 1,200 777s.